Guest Services works hard to create environments where each guest feels safe and comfortable. You can expect to have fun, care for guests, share community with your team, and play a significant role in helping someone have a remarkable experience. Greeters and Ushers - When a guest walks through our doors for the first time and receives a warm, friendly welcome, it makes a powerful impact. The Greeters and Ushers perform that vital role. In fact, they're part of the reason people come back! 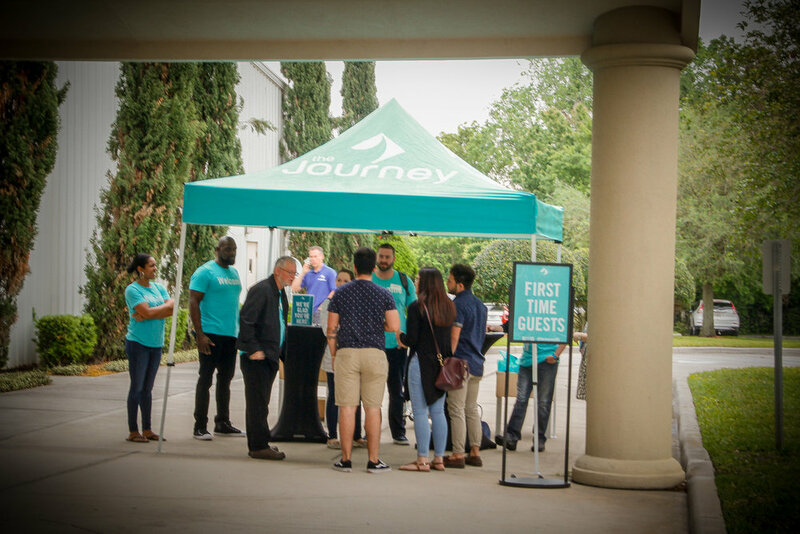 Parking - This team serves the Journey's guests by helping them locate a convenient parking spot, as well as assisting with the flow of traffic during our weekend services and special events throughout the year. 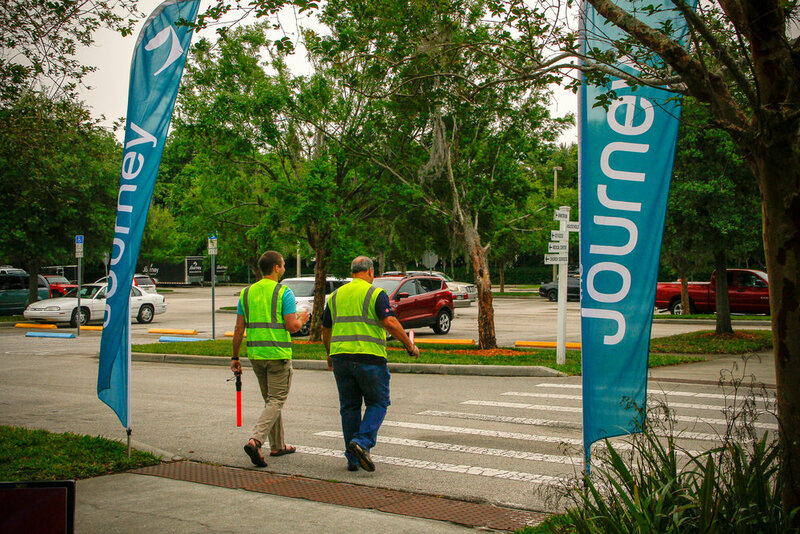 Security At the Journey, it is our desire that each person who steps foot on our campus feels safe and secure. For that reason, we have members of our Security team stationed throughout our grounds during each of our weekend services and special events. Safety Team With hundreds of people gathering on our campus each weekend, occasional medical emergencies arise. When they do, our Safety Team is the first to take action. Medical professionals volunteer their time to be available at each of our services. If you are a licensed physician, nurse, paramedic, EMT or PA, and you have emergency medical experience, we need you. Every Sunday our volunteers show up and work together in their unique roles to create a loving environment for our children. 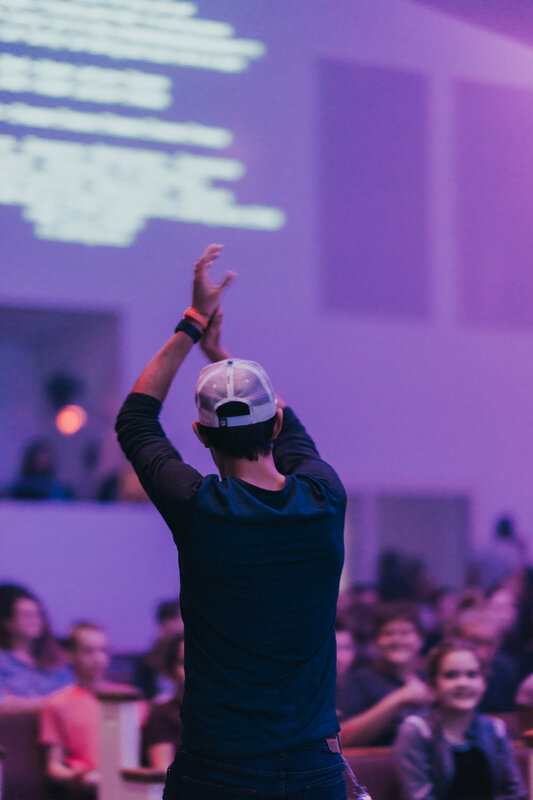 Journey Kids is completely fueled by volunteers. We could not exist without their leadership and expertise. Small Group Leaders have the privilege of developing relationships with children. In our small group environments, they will lead discussions and participate in activities that will allow children to have a greater understanding of the weekly lesson. We believe relationships take time and a weekly commitment. This position is a weekly or biweekly commitment. Small Group Leader Helpers have the privilege of developing relationships with children and the Small Group Leader. They are responsible for supporting and helping the Small Group Leader with discussions and with preparing lessons and activities. We believe relationships take time and a weekly commitment. This position is a weekly or biweekly commitment. Host plays a vital role in the Journey Kids. They have the privilege of encouraging spiritual growth through communicating the Bible story in a creative, attention gripping way. Consistency is important in the ministry and the Host is required to commit weekly to serving and being prepared to introduce the Bible lesson while engaging the children to learn. Worship has the honor of using their spiritual gifts to lead the children in worship. Consistency is important in the ministry and the Worship Leader is required to commit weekly to serving and being prepared to lead the children in worship. Dance supports the singer (without a microphone) in meaningful dance and worship. Consistency is important in the ministry and the Dance Team is required to commit weekly to serving and being prepared to help lead the children in worship. Tech supports the team members by operating sound, lighting, and computer equipment in a timely manner. They are trained and coached on equipment; no technical skills are required. The requirement for this position is weekly or bi-weekly. The Behind-the Scenes person would serve during the week supporting the ministry by performing different tasks such as, but not limited to: clerical duties, editing curriculum, and printing curriculum (i.e. lesson plans, God Time Cards, Parent Cue Sheets). First Impressions are the first people to greet our guests when they come to the Children’s Ministry. They are responsible for greeting, registering new guests, and walking them to the Auditorium. Journey Students is the middle school and high school ministry of the Journey that meets every Wednesday in an effort to lead students to pursue God passionately by connecting them to leaders and to each other. We believe that before you behave, before you believe, you belong here. Small Group Leaders – Small Group Leaders invest in the lives of a small group of students divided by grade and gender. 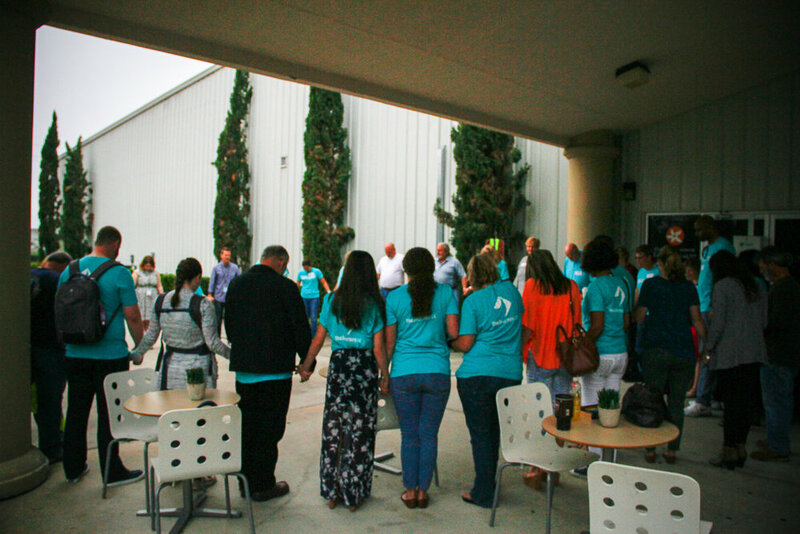 Our leaders commit to be a part of Pursuit events every Wednesday night during the school year and lead their group time two nights each month. Small Group Leaders commit to serve for three or four years and follow their group as they move from one grade to the next. Assistant Small Group Leaders – Assistant leaders commit to plug into one of our small groups for one school year and help the small group leader facilitate activities and discussions. Behind the Scenes – There are always needs behind the scenes in all that we do in Pursuit. If you have a heart for students and don’t know where you might fit in, let us know and we will help you find a role. Special Events – There are many opportunities to help plan and chaperone special events, including yearly Retreats, Reaching Events, Sending Trips, etc. The commitment for these roles is a short period of time. We are looking for talented musicians who love Jesus and want to be a part of our worship ministry here at the Journey. If you are a musician or know someone who would be a great fit for this ministry, this is the info you need. It can be any song you like, a live performance you’ve done, or just a cell phone video you take in your home. The purpose of this is to take away some of the stress of a first time audition: we just want a sample of what you can do. Every week it takes people to provide an exciting and excellent experience in our worship services. Sound tech – A sound tech’s primary responsibility is mixing audio during our weekend worship experience. If you have worked or served in music production or have a background in music, this technical position may be a perfect place for you to serve. If you are interested, please sign up below and we will be in touch with you shortly. Lighting Tech – A lighting tech plays a crucial role in creating the perfect environment for worship. If you are creative, enjoy music and have an interest in combining your creativity with technical skill, lighting may be a great place to serve. If you are interested, please sign up below and we will be in touch with you shortly. ProPresenter Tech – A ProPresenter tech supplies all visual information throughout the worship service. From the opening of the auditorium doors to the closing prayer, a ProPresenter tech advances all media used to communicate our weekend worship lyrics and message. If you are a detailed and focused individual, who enjoys music and has an interest in production, ProPresenter is a great place to serve. If you are interested, please sign up below and we will be in touch with you shortly. We have the incredible opportunity to create amazing environments at DeLand High School every Sunday. Our Load In/ Load Out team plays a huge role in making that happen. Each Sunday, members of this team help unload the equipment from our trailer and get the cases to the appropriate areas for each ministry. At the end of the day, they load the equipment back into storage. Without this team, our ministries could not function properly. If you love to work with your hands and see tasks being accomplished right before your eyes, week after week, this team is for you! Throughout the week there are so many different things going on in the background that require talented volunteers to make them happen! Some of the volunteer roles are photography and video. We would love to talk with you about joining our team. If you are interested and would like more information about volunteering in the Communication Arts Department, fill out the form below.